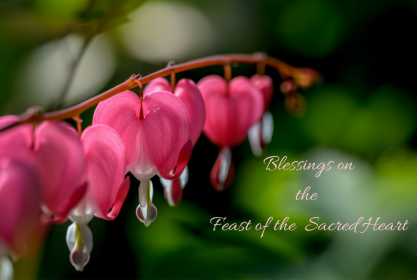 We are pleased to share with you Reflections from both the Philadelphia area and Buffalo celebrations of the Feast of the Sacred Heart. If you would like to know more about our spirituality, please feel free to contact us at any time. A number of years ago, we, the Grey Nuns of the Sacred Heart, were gifted with a very special conference given by Lowell Glendon, s.s., entitled the Four Metaphors. A few years later, Sr. Jean Liston, then president, with the assistance of Sr. Mary Elizabeth Looby, had the conference material printed and provided each of us with a copy. What a pleasant and nostalgic surprise it was to find that our first reading was a reflection on the devotion of the Grey Nuns to the Sacred Heart. My words today are a reflection on the thoughts shared with us by Lowell Glendon. Lowell explained to us the difference between the spirituality of Paray-le-Monial and that which had gained recognition during the 1600’s, the French School of Spirituality. He indicated that Marguerite, with her brief background with the Ursulines when she was in school, and her French roots, would have been influenced by this new School of Spirituality. She, in turn, with her prayer and legacy to us, would have based what she believed on the influence and ideas of what is known as the French School. The purpose and depth of the devotion to the Sacred Heart had grown and developed through the French School. Previously, the devotion to the Sacred Heart indicated Jesus’ love for us and our need for reparation for the sinfulness of ourselves and for that of all persons. In the French School, this devotion became a call to communion with Jesus, complete union, becoming one with Jesus. Biblically, and in the French School, the HEART was all that made a person who and what he was. It included mind, thought, passion, fears, talents and gifts, emotions — everything. Devotion to the Sacred Heart, then, meant the invitation to become ONE heart, ONE mind with Jesus, to see the world and each individual person as Jesus saw her. “As I live, Jesus lives in me.” The purpose of my being becomes the LIVING OUT, the “being” Jesus wherever I am. What were Jesus’ feelings or emotions? It could be joy, fear, surprise, anger, disappointment. This picture satisfies the first point, Jesus before our eyes. Let us, for a moment, consider the Agony in the Garden. Jesus must have considered confusion, fear, uncertainty. This time would be similar to us facing change, illness or fear of illness, anything new which brings uncertainty. What were Jesus’ thoughts? His desires? His behavior? Am I peaceful, content, accepting in spite of my fear and trepidation? Do I know that I can depend on my Father’s love and strength to sustain me, no matter what happens? Am I willing to accept the circumstance, even though I do not understand God’s will? Do I go forward in trust, as Jesus did, relying on God without clear evidence about the outcome? Do I back down and let my fear overtake me? What this brief exercise shows us is that, if we seek union with the Heart of Jesus, we must REFLECT Jesus, BE Jesus, in all parts of our lives – in decisions we make, in our relationships with all other people, with our hurts, our pains, our loneliness, and with all the possessions which we have and are called to share. am I nourishing the ongoing contemplative search to be transformed into the mind and heart of Jesus? is this particular behavior, word thought coming out of that spirit? does this decision, action, idea bring me into a greater communion with Jesus? It means for us that devotion to the Sacred Heart of Jesus requires working toward total communion or union with Jesus, every day, every moment of our lives. It means that we are called to be the mind, the heart, the actions and emotions, the words of Jesus that reflect what Jesus would do in our world today. We must be the Jesus that the world, our world, is longing to see! Influenced by the French School, which Marguerite probably was, it means that we strive to be united with Jesus in the closest union, and that this inseparable union becomes apparent in our behavior, the love we have for one another despite differences, the respect and care that we offer each other and all of God’ s precious creation! Welcome to this celebration of the Feast of the Sacred Heart of Jesus. As Grey Nuns of the Sacred Heart, Associates, and friends, we take joy in celebrating this feast, in which the Church remembers the great love streaming forth from the heart of Jesus, and the realization that that love is flowing over us today, and through us, to others. We are at a sacred site for the Grey Nuns, this building which first housed Holy Angels Academy. Begun in 1861, the Academy started using this building in 1872. Later, the building became the home of D’Youville College, which was chartered in 1908. And, when the Grey Nuns of the Sacred Heart became an independent congregation of Sisters in 1921, that happened right in this chapel. That was 97 years ago. In three years we’ll be able to say 100! We are grateful to have as our celebrant today, Father John Stanton, Pastor of St. John XXIII Church in West Seneca, where he leads with spiritual depth, enthusiasm, and a climate of welcome, and where he is helping to build a strong community of faith. And a very great blessing: Joining us to lead the music is our friend, Bruce Woody, who has been with us in sorrow, as when Sr. Ruth Penksa died, and today is with us in joy. Let us celebrate together the great love poured out upon us by the Sacred Heart of Jesus. “What are the dispositions, attitudes and intentions of Jesus? How would Jesus view this situation/event? In our Grey Nun constitutions we profess that individually and communally, we strive to put on the mind and heart of Jesus in order to be enriched and transformed by love. “remain in Him, in His love,” to abide in his love. What a wonderful invitation! Jesus was compassionate to all He met: curing the ill, welcoming the little children, offering hope to a dying thief. Marguerite, too, was moved by compassion for the poor, the sick and elderly, unwanted babies and desperate mothers, prostitutes and foreign enemies of her country. Each of us is called to bring compassion to our small part of this world, to see those suffering and in need, and respond. Jesus was courageous; He acted from his heart, from the core of His Being. He confronted injustice and greed, had dinner and made friends with men and women, and with those on the fringes of his society who were discriminated against. He had a vision of the Reign of God that directed all His works and actions. Marguerite, too, acted from her vision to serve the poor, no matter what the cost. She suffered ridicule and was ostracized by some from the upper classes in Montreal. She confronted civic and church leaders, including her own son, when she felt that she and her poor were not being treated fairly. Each of us can learn to act from our own heart, our vision, when it is shaped by Jesus’ vision. As for Jesus and Marguerite, so, too, for us. Let us embrace a contemplative stance in our life, and have hearts moved by compassion and courage. The 3c’s! This Icon, a depiction of the heart of Christ by Robert Lentz OFM, a Franciscan friar. I will read his description of his inspiration for this icon. A tall metal sculpture surveying Lake Erie down at the Niagara Greenway in the Outer Harbor. This sculpture, by Larry W. Griffiths Jr. is a very tall, androgynous person, with arms extended, and a heart that is carved out, an open heart. It can be seen from many angles and seems to reach out to the Lake, to me, to the trees and fields, to grain silos and to the Buffalo skyline. If you haven’t yet, go down and see it – a modern Sacred Heart embracing all. And finally, as some of you know, I practice Yoga. And it hit me that in Yoga that you always return to the heart center. Watch. Then you go out from the heart center. Let us pray this body prayer together: you can stand or stay seated. Put your hands together at heart center; now lift up and out and return to heart center. Now go out from heart center and share the love of God and the love of your heart with our world, with all the Earth.